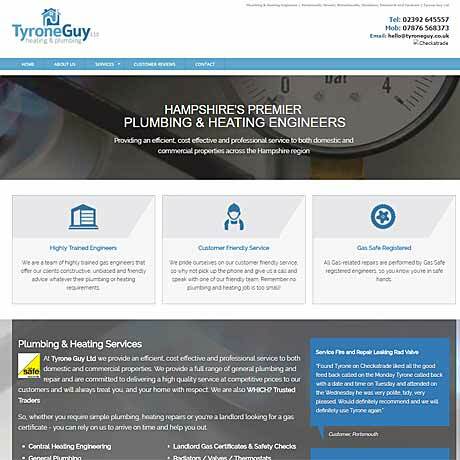 I design inexpensive and eye-catching custom websites for a wide range of Portsmouth businesses and they all come with 2019 SEO requirements to ensure effective digital marketing for your website resulting in good search results. Each web design is unique and can expect to find its way on to the first page of Google search results. I provide fast, secure and reliable web hosting for all my sites. I build mobile friendly websites for Portsmouth businesses that are designed to display clearly on all kinds of devices and built so that information about your business can be accessed quickly and easily. You'll also get great web design support from me after your website is published - so any changes you need made will be done promptly. This is not always the case! If your business is located in the greater Portsmouth area (incl. Cosham, Drayton, Paulsgrove, Waterlooville, Purbrook and Cowplain) you'll already have a considerable choice of web designers. If you choose me you'll get a reliable professional who will support you all the way - long after publication - and I'll even write the website content for your site, if you prefer. Have a look at examples of my work and see how I've already helped local businesses not just in in the Portsmouth area but around the South of England. I've checked and on average my clients have paid between £300-£700. A well–optimised website can pay for itself with a couple of customer enquiries. See More on Prices. I've developed a framework for building websites that allows originality as well as carefully planned coding. My websites look great as well as doing their job. Portfolio. My USP is reliable support long after your website is published. I'll do all your updates promptly and keep it in the Google search results. Read More. Getting more customer enquiries is the the reason for most websites - no matter how successful you already are. But just having a website is not enough. These days who looks in a phone book for a local business? Most people look on the internet and if you're not high in the rankings - they'll pick your competitor instead. Therefore, you'll need one that's been been carefully constructed with deployed SEO - search engine optimisation. If you watch this video I'll briefly explain that getting higher in the search engine results now means that more attention must be paid to quality website content. If you're unsure whether or not your website is mobile friendly - follow this link and see for yourself with Google's online mobile-friendly test. I will certainly be singing your praises to anyone requiring a website. In fact my wife has a friend who is leaving her current job at the end of this month and setting up her own business selling quality cakes! The website is all we had hoped for. Many thanks for all your patience and for a finished result which is just great. Not only has the website been great for our clients but it has also saved our staff a lot of time. Monthly payment systems for websites are not new - companies like Y... tie people into contracts that can turn out to be be very expensive and difficult to extricate yourself from when you try. And it's not only the big boys who operate like this. It's your choice but I can't see any sense in paying for a new washing machine by the month - with no end in sight. It would end up costing a fortune. I've written about this in more depth on my blog if you'd care to look at the full article: Pay As You Go Websites. Over and above the cost of the initial building of your new website there is an annual service charge of £50 for secure, fast hosting (mandatory) and I provide a support service for site security, SEO maintenance and content updates when requested that will keep your site looking fresh and relevant. The cost will depend on the size of your site.